Local music aficionados likely know Seth Gallant as the lead vocalist for Burlington’s In Memory of Pluto. On stage and on record with his interstellar indie-rock outfit, the dynamic front man is nothing short of a firebrand. A veritable powder keg of energy, he is an electrifying performer. But with his charmingly understated solo EP Songs for a Snowstorm — the disc comes packaged in, of all things, a brown paper bag — Gallant sets glitzy showmanship aside and offers a glimpse into the blue-eyed soul of a multifaceted artist. At the moment, it seems you can’t release an intimate solo record unless it was recorded in the bleak midwinter at some backwoods cabin, à la Bon Iver’s For Emma, Forever Ago. I think it’s now an indie-folk law, actually. Gallant’s five-song gem gets off on a technicality as it was recorded in the basement of his parents’ house in Maine last March. Close enough. While his disc can’t possibly match For Emma’s haunting, ethereal brilliance — nor does he appear to be trying to, wisely — Gallant manages a similarly stark yet comforting feel. Fading in with strummed acoustic guitar, the disc begins with “The Radio Is Off.” Among Gallant’s finer qualities as IMOP’s leading man is his uncanny knack of divining the catchiest melodic route from point A to point B. He shows a similar, though far subtler, ability here. It’s a melancholic lament, to be sure. But the captivating melody will leave you wanting more upon the tune’s cleverly abbreviated conclusion. Fortunately, Gallant obliges with the following number. Where he favors a brooding tone on the previous track, “So Cold” finds the singer matching the tune’s easy rhythmic cadence with casual breeziness. “Pretty Little Things” is next and features yet another mournful melody that sticks to the ribs. “The Giving Tree” marks Gallant’s heftiest lyrical foray, and he walks a fine line between steely profundity and earnest melancholia. But even in less tactful poetic moments, his striking melodic turns lift the song from melodramatic malaise. As Gallant states in the EP’s brief liner notes, the tunes found here were written over a period of five years. He then forgot about the songs, before revisiting them in the quiet clarity of a Down East late winter. And we should be glad he did. Refreshingly spare and devoid of pretense, the disc is a humble reminder that the best things often do come in small packages. Or in this case, a brown paper bag. 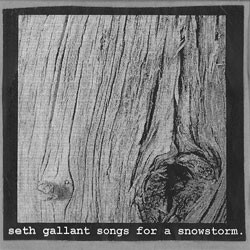 Seth Gallant releases Songs for a Snowstorm Wednesday, April 22, at The Monkey House. Proceeds from the show and the EP go to Brother Xavier’s Home of New Life orphanage in Kolkata, India.